Are Syria and Pakistan Pieces of the Puzzle for Assembling a Mega Gas Pipeline to China? It was estimated in 2007 that approximately 96.3 percent of the amount of projected natural gas which would be “imported by continental Europe would be controlled by Russia, Iran, and Syria under such an arrangement” (Ibid., emphasis added). The transformation of Syria into a client state would not only help erode the Resistance Bloc [comprised of the Palestinians, Iran, Lebanon, Syria, and Iraq], but it would give control over the Levantine energy corridor in the Eastern Mediterranean to Israel and the NATO powers. A direct land bridge would connect Israel and Turkey, and Iran would be cut off from its smaller Levantine allies in Lebanon and Palestine, which would weaken their resistance to Israel. The Mediterranean Sea would become a full NATO lake and a north-south energy transit route in the Levant would fall under Atlanticist control. The Levantine Basin, extending from Gaza to Alexandretta, has several large natural gas reserves that have been the subjects of regional tensions over extraction and ownership rights. Israel has been at odds with both Lebanon and the Palestinians in Gaza over the issue. Both Iran and Russia — the world’s two largest proprietors of natural gas — have interests in these natural gas reserves and have been involved in projects to help Lebanon and Syria exploit and develop their gas reserves. With control of Syria or parts of a fractured Syria secured, these natural gas reserves would totally be encompassed by the Atlantic Alliance and the Iranians and Russian would be pushed out (Nazemroaya 2012:324-325). The geo-political reality in Syria also worked against the Nabucoo Pipeline and Turkish interests. 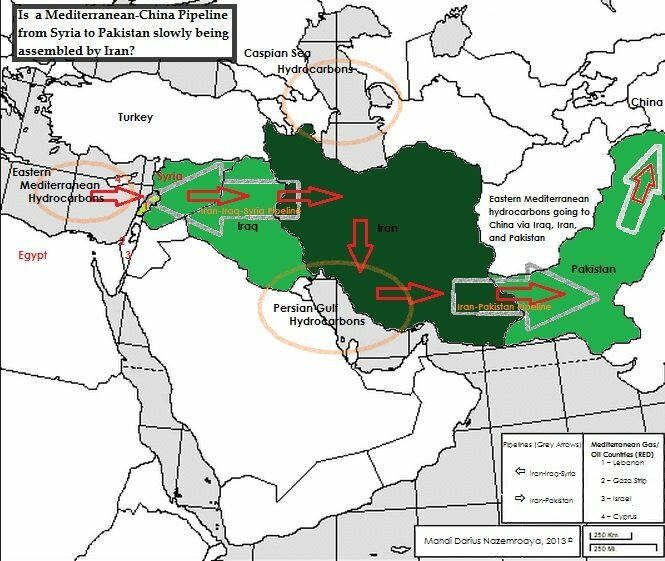 In context of this Eurasian energy strategy, what should become clear with the announcement of the construction of the Iran-Iraq-Syria Pipeline, after the Iraqi government gave Baghdad’s February 2013 green light to the project, are the connections between Syria and Pakistan with one another and with China via Iran. The Iran-Iraq-Syria Pipeline, which will also pass through Lebanon, has been presented as a route to export Iranian natural gas to the shores of the Eastern Mediterranean. The direction of the flow of natural gas, however, can be reversed. Eastern Mediterranean natural gas from the coasts of Lebanon and Syria, possibly even the Gaza Strip and Egypt, can be exported eastward through the pipeline and channeled through Pakistan to China. In part, aside from its own vast reserves of natural gas, this would also explain Iran’s mega LNG infrastructure projects, which aim to make Iran an international hub of natural gas processing and trade. In regard to strategic energy routes, the Pentagon and NATO see the [Iran-Pakistan-India] Friendship Pipeline as a threat or rival energy corridor to the ones they have planned in Eurasia. Islamabad’s steadfast refusal to bow to US demands to cancel the pipeline with Iran is directly tied to Chinese geostrategic interests. As mentioned earlier, there is a strong possibility that China could be included in the pipeline project or that the pipeline could form as an Iran-Pakistan-China pipeline that would bypass India. This is a threat to the US aim of containing China and isolating Iran, respectively, by way of controlling Chinese energy supplies and manipulating the direction of Iranian energy exports (Ibid.:185-186). In 2007, with vital Chinese participation, the port at Gwadar became adapted for hosting oceanic traffic. The Chinese give major strategic value to Gwadar, because it is located on the coast of the Arabian Sea at the mouth of the Gulf of Oman (Oman Sea) near China’s strategic ally Iran and the energy-rich Persian Gulf. Chinese strategists want to integrate Gwadar with China’s Xinjiang Uyghur Autonomous Region like the Karakoram Highway. If this should be done then Chinese energy imports to China can bypass the high seas and further insure Beijing’s energy security by insulating China from the US Navy or any other hostile forces that would try to cut Chinese energy supplies in the scenario of a war. Iran can also directly import to China from Gwadar. The important question for both Beijing and Washington is if an independent Baluchistan would serve or work against Chinese naval interests in Gwadar. 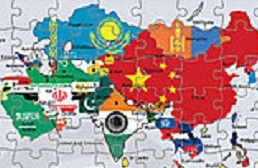 By supporting Baluchistan’s secession from Pakistan or engineering a Baluchistani-Pakistani conflict the US probably hopes that Beijing would be forced to support Islamabad’s efforts to maintain Pakistan’s territorial integrity and its own interests. This would alienate Baluchistan from China and maybe result in the loss of Gwadar for the Chinese (Ibid.:186-187). In summary, the Iran-Iraq-Syria Pipeline and the Iran-Pakistan Pipeline are fragments of the same grand Eurasian natural gas pipeline that are being weaved together like a carefully crafted Persian carpet. This gives added context to the conflict in Syria. It also helps explain the positions of countries like Qatar and Turkey that want regime change in Damascus. This is also one of the reasons that the European Union has unilaterally sanctioned the Iran LNG Company (ILC) in 2012, just before Iran began its LNG exports. The Tamar gasfield, discovered in 2009 off Israel’s coast, holds great promise. Leviathan, discovered in 2010, holds even more. The US Geological Survey reckons that there could be 120 trillion cubic feet (tcf) of technically recoverable gas in the Levant basin, which washes the shores of Israel, Lebanon, Syria and Cyprus (The Economist 2013). Hezbollah even warned Israel in 2011 “against trying to steal Lebanon’s maritime resources and said it would retaliate against any Israeli attack on [Lebanon’s] oil and gas installations” (AP 2011). A senior United Nations official even intervened to ask Lebanon and Israel to cooperate in promoting oil and gas exploration in the Eastern Mediterranean (Ibid.). Israel’s sea borders with Lebanon are disputed. And its energy partnership with Cyprus has stoked another fire. Turkish-controlled northern Cyprus’s claims overlap with Greek Cypriot ones. Turkey wants to stop any exploration. To emphasise this point, it sent a warship into the area after test drilling started last year (The Economist 2013). Exporting liquefied natural gas (LNG) to markets where prices are high would be nice. But this would require huge investments and a big coastal site. Cyprus is keen but doesn’t have the cash. Israeli gas could be liquefied in Cyprus, but that would mean Israel ceding control—an unpalatable idea for some nationalists. An LNG plant in Israel would be impractical, since space is limited, environmentalists unyielding and security hard to guarantee (Ibid.). The petro-politics in the Levant are an additional factor or layer that can be used to question the objectives of the financial siege against the Greek Cypriot economy. Ultimately, in context of Eastern Mediterranean natural gas supplies, Syria is about China, just like the present “Second Scramble for Africa” that has targeted Sudan, Libya, and Mali. In this regard NATO’s war on Libya and the siege against Syria are two fronts in the same war, which is aimed at neutralizing the Chinese. The same goes for the internal crises in Pakistan. The Pakistani province of Baluchistan figures importantly in this equation. Baluchistan is not only geo-strategically important in regard to Eurasian energy linkages, but is also rich in mineral deposits and energy reserves. In most cases these minerals and energy reserves are all untouched. It would be far easier to procure the mineral and energy recourses of this area from a relatively more lightly populated independent Baluchistan republic that would be happy selling its resources at lower prices. It could also help destabilize the easternmost Iranian provinces, including the province of Sistan-Baluchistan. An independent Pakistani Baluchistan could be at odds with Tehran over territorial claims to Sistan-Baluchistan (Nazemroaya 2012:186). This is also probably the reason that General Pervez Musharraf has returned to Pakistan from his self-imposed exile in the United Arab Emirates, aside from the end of the united front against him by the Pakistan People’s Party and Nawaz Sharif’s Pakistan Muslim League. It has become clear that there was outside pressure, such as from Saudi Arabia, on the Pakistani courts and government not to prosecute him. General Musharraf’s return to Pakistan to run for president has no chance of success. Musharraf, however, can act as a spoiler and further divide Pakistani society. His return has also got the attention of the cautious in Beijing. If the Iran-Iraq-Syria Pipeline and Iran-Pakistan Pipeline are connected and end up supplying China, it will amount to a major blow against the primacy of the United States. The US aims to upset the completion of either project. Washington’s tensions with Tehran over the Iranian nuclear energy project should therefore also be viewed from a paradigm that also has this in mind. Arrighi, Giovanni. 2010. The Long Twentieth Century: Money, Power and the Origins of our Times. 2nd ed. New York: Verso. “Gas in the eastern Mediterranean: Drill or quarrel?” The Economist January 12-18, 2013:58. “Hezbollah warns Israel against ‘stealing’ gas from Lebanon.” Associated Press. July 26, 2011. Nazemroaya, Mahdi Darius. October 14, 2007. “The ‘Great Game’ Enters the Mediterranean: Gas, Oil, War, and Geo-Politics.” Global Research. Nazemroaya, Mahdi Darius. 2012. The Globalization of NATO. Atlanta, Georgia: Clarity Press.